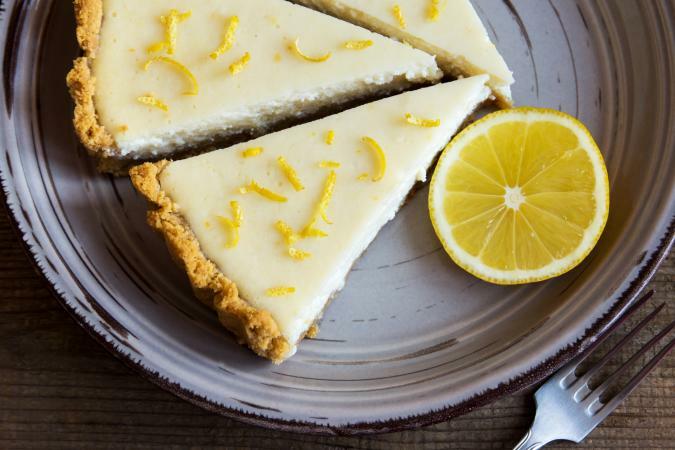 If you're looking for a super easy lemon cheesecake recipe, you have a lot of options. There are many kinds of easy cheesecakes you can make, including some that you don't have to bake at all. This is recipe is so quick and easy that it almost makes itself! Actual prep time is only about ten minutes and then it takes an hour or so to set up in the refrigerator. This is a great dessert when you discover you're about to have last-minute dinner guests and people will think you slaved away all day. With an electric beater, combine softened cream cheese and 1/2 cup milk until very smooth. Slowly add in 1-1/2 cups of milk, continually beating to prevent lumps. Decrease beater speed to low and add in pudding mix. Mix until there are no lumps. Pour into graham cracker crust and refrigerate for one hour, or longer if you have it. Top with whipped cream and serve chilled. 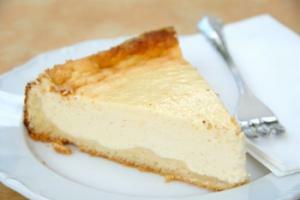 This lemon cheesecake whips up quick in a blender and then cooks for only 30 minutes. You'll have this cake on the table at lightning speed. Grease a 9" pie plate. Place 3/4 cup of sugar, Bisquick, eggs, cream cheese, 2 teaspoons vanilla extract, lemon juice, and lemon zest in a blender. Blend on high speed, stopping to stir occasionally, until completely smooth. This should take about 3 minutes. Bake uncovered for about 30 minutes or until center is dry to the touch. Remove from heat and allow pie to cool to room temperature. To make topping: combine sour cream, two tablespoons sugar, and two teaspoons of vanilla extract until completely smooth. Spread over top of pie and cover with plastic wrap. These creamy lemon bars are sure crowd pleasers, especially with children. Kids will love their lemony sweetness while adults will adore their smooth cream cheese texture. Grease the bottom of a 9x13-inch pan. Remove one cup of cake mix from package and set aside. Combine remaining mix with one egg and 1/3 cup vegetable oil. Press firmly into bottom of 9x13-inch pan and bake for 10 minutes at 350ºF. Combine the remaining one cup of cake mix, two eggs, cream cheese, sour cream, and sugar. Stir until completely smooth. Stir in lemon zest and juice at the end, gently folding into mixture. Fill crust with filling and bake for 30 minutes. Remove from heat and let cool for 20 minutes, then place in the refrigerator and cool for one hour. Serve chilled with a dollop of whipped cream. If you're looking for another way to use tofu, this lovely cheesecake is just for you. Honey and lemon give this dessert a mellow sweetness that's difficult to resist. Using a blender, combine the tofu, cream cheese, eggs, honey, oil, vanilla, and lemon juice. Blend until all ingredients are smooth and incorporated. This may take a while since tofu can be thick. After the cheesecake has cooled, add fruit topping like berries if desired. When the urge for a slice of lemony cheesecake hits, you don't want to spend a lot of time fussing around in the kitchen. Any of these recipes will produce a delicious cheesecake in relatively little time. In fact, you just might find yourself making this dessert more often.